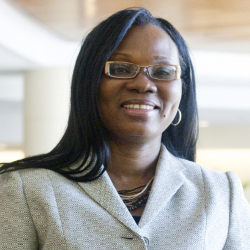 Folakemi Odedina, Ph.D., a professor of pharmacotherapy and translational research in the University of Florida College of Pharmacy, has been awarded a 2018 Carnegie African Diaspora Fellowship to help expand oncology clinical trials in Africa. Odedina will travel to South Africa this summer and collaborate with Lynette Denny, M.D., Ph.D., chair and a professor of obstetrics and gynecology at the University of Cape Town, in developing an Africa Virtual Oncology Platform to support oncology clinical trials. The platform will provide comprehensive information on oncology clinical trials infrastructure, resources and registries in Africa. Project leaders will also assess the capacity and readiness of African institutions and investigators for oncology clinical trials research. Odedina and Denny will work with representatives from leading oncology organizations to implement the program, including the U.S. National Cancer Institute, the African Organization for Research and Training in Cancer, the International Agency for Research on Cancer, the Prostate Cancer Transatlantic Consortium, BIO Ventures for Global Health and several others. In addition, scholars participating in the University of Florida’s ReTOOL Program that trains underrepresented minority students to be cancer scientists will contribute to the project. The 2018 ReTOOL cohort includes 15 students from the University of Florida, Florida A&M University, Florida Memorial University and Edward Waters College. Odedina’s project is part of a broader initiative that will pair 55 Carnegie African Diaspora Fellowship Program scholars with one of 43 higher education institutions and collaborators in Ghana, Kenya, Nigeria, South Africa, Tanzania and Uganda. The visiting fellows will work with their hosts on a wide range of projects that include controlling malaria, strengthening peace and conflict studies, developing a new master’s degree program in emergency medicine, training and mentoring graduate students in criminal justice, archiving African indigenous knowledge, creating low-cost water treatment technologies, building capacity in microbiology and pathogen genomics and developing a forensic accounting curriculum. To deepen the ties among faculty members and their host institutions, the program is providing support to several program alumni to enable them to build on successful collaborative projects they conducted in previous years. The Carnegie African Diaspora Fellowship Program, now in its fifth year, is designed to support higher education in Africa, build capacity at the host institutions, and develop long-term, mutually beneficial collaborations between universities in Africa and the United States and Canada. It is funded by the Carnegie Corporation of New York and managed by the Institute of International Education in collaboration with the United States International University-Africa in Nairobi, Kenya, which coordinates the activities of the advisory council. A total of 335 African Diaspora Fellowships have been awarded for scholars to travel to Africa since the program’s inception.